Olympic is one of only three national parks in the United States that has a ski lift. (The others are Yosemite in California, and Cuyahoga Valley in Ohio. 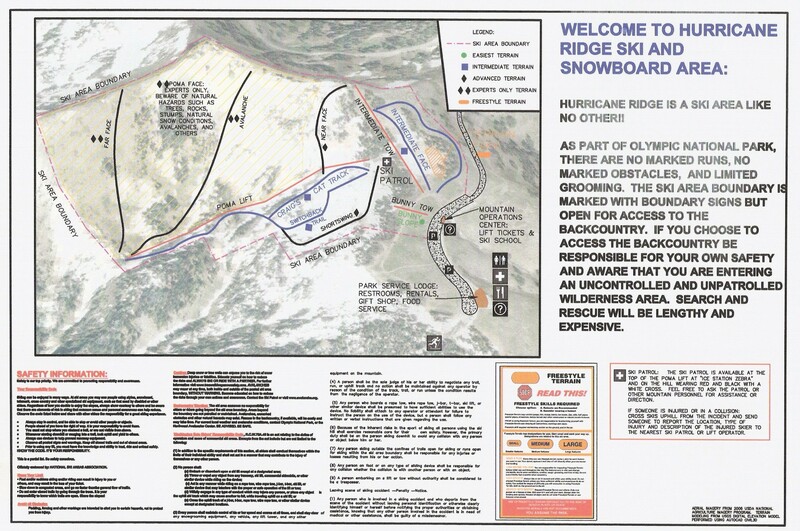 Rocky Mountain closed its ski resort in 1991.) The Hurricane Ridge Ski and Snowboard Area gives you opportunities for snowshoeing, cross-country and downhill skiing, snowboarding, and tubing. As part of Olympic National Park, there are no marked runs, no marked obstacles, and limited grooming. The ski area boundary is marked with boundary signs but open for access to the backcountry. If you choose to access the backcountry, be responsible for your own safety and aware that you are entering an uncontrolled and unpatrolled wilderness area. Search and rescue will be lengthy and expensive. Ask about free lift tickets for 4th and 5th graders. Thank you Hurricane Ridge Education Foundation! In 2017 we have a limited number of free ski and snowboard school lesson for our three-week lesson program for 4th grade students. For details call 848-667-7669.
marked, two routes use unplowed roads which gives you easier navigation. The Meadows route above the Hurricane Ridge Visitor Center is the easiest to ski but you will be exposed to the sun and wind..